“MIRACULOUS TALES OF LADYBUG & CAT NOIR” PREMIERING ON DISNEY CHANNEL! PRAGUE – 26 January, 2016 – Disney Channel will premiere the much anticipated series, “MIRACULOUS Tales of Ladybug & Cat Noir,” in the Czech Republic on Monday, 15 February at 4:30 p.m.
Marinette and Adrien are two junior high students, each chosen to save Paris from the akumas, evil creatures responsible for turning normal citizens into an army of super baddies! With the help of their magical creatures, the kwami, these two school kids each transform into Miraculous Ladybug and Cat Noir, crime fighting superheroes that have thrilling adventures throughout the streets and rooftops of Paris unaware of each other’s true identities. A bubbly, creative, kind and a little bit clumsy art student, Marinette has a huge crush on Adrien, the son of a high profile fashion designer, who is unaware of Marinette’s awkward advances. 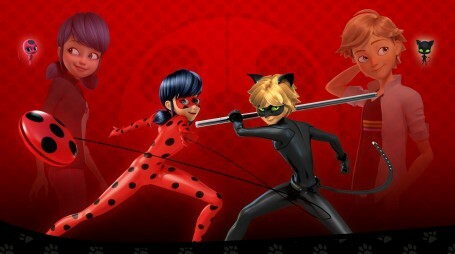 But, when Marinette transforms into Miraculous Ladybug, she becomes more self-assured, and Cat Noir, Adrien’s superhero alter-ego, will do almost anything to impress her. Together, these two heroes must fight against Hawk Moth, who is the mastermind behind Paris’ endless flow of Akumatised Villains! Miraculous Tales of Ladybug and Cat Noir is a Japanese-French-Korean action-adventure-comedy show produced and animated by Zagtoon and Method Animation, in co-production with Teio Animation, SAMG Animation and SK Broadband. Produced by Jeremy Zag (Rosie, Kobushi and Popples) and Aton Soumache (Iron Man: Armored Adventures, Pinky & Perky Show), and executive produced by Jared Wolfson (Monsuno), Pascal Boutboul, Sébastien Thibaudeau (Kobushi, Sherlock Yack: Zoo Detective), Alexandre Lippens (Mr. Nobody, Coco Before Chanel), Jean-Yves Patay and Cédric Pilot (Iron Man: Armored Adventures). The show is directed by Thomas Astruc (Mikado, Totally Spies! and W.I.T.C.H), and the music for the show is composed by Jeremy Zag.